Opener 'Red Clay' starts as a pretty out-sounding modal jam before hitting on a groove that provides a backdrop to much of the rest of the piece. It's funky without being rigid, giving flexibility to the soloists and allowing Hancock to do his usual tense comping but with a funky edge. 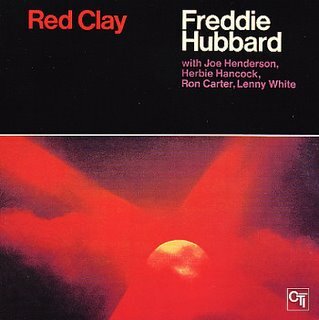 The track positively crackles with great solo playing - Hubbard in his usual, inimitable style; Hancock is sinuous as he darts and dives between the twin horns. Carter almost steals the show, inventive and imaginative whilst remaining totally in the groove at all times. 'The Intrepid Fox' is even better - less obviously funky but with a deep sense of groove and strong jazz feel. White comes over like a funkier Tony Williams, combining some of his virtuosity with his own youthful exuberance to deliver a genuinely exciting performance. It's been said that Freddie Hubbard considers this his best album. There's definitely a case to be made - his playing is as strong as ever, the rhythm section are on top form as you might expect, and Henderson is a delight, pushing the whole quintet as far as he can whilst staying in the groove. In fact the record as a whole is simply an extension of the hard and post bop these guys were playing in the 60s, updated with some funk and soul-jazz influences. Oh, and it's damn good too, and easily available. Get it now.